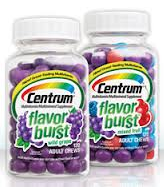 High Value Coupon for Centrum Flavor Burst at Target! Target is having a good deal for Centrum Flavor Brust! 1.Buy 3 Centrum Flavor Burst 60 ct for $23.97. 2.Use one $5/2 coupon for Nature Made vitamins or supplements Target Coupon Pharmacy Mailer x11/1. 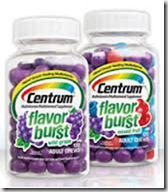 3.Use three $3 coupon for Centrum Flavor Burst Chews 60 ct from 9-30-12 RP x11/24. 4.Get $5 Gift Card Back wyb 3. 5.You pay $4.97 for 3 or $1.65 each after coupons and gift card. Minute Maid Juice Box,10 pk for $1.90 at Target! High Value Coupon for Dr. Scholl’s For Her Comfort Insoles at Target!